Inner Focus The Pokémon is protected from flinching. This Pokemon will not Flinch. Pressure* The Pok�mon raises the foe's PP usage. Opposing Pokemon must use 2 PP per move. 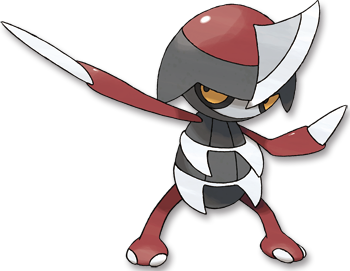 Black Blades comprise this Pok�mon's entire body. If battling dulls the blades, it sharpens them on stones by the river. White They fight at Bisharp's command. They cling to their prey and inflict damage by sinking their blades into it.